For the past week, I’ve been cruising France’s Seine River aboard Tauck’s newly-refitted, 98-guest ms Sapphire as part of the line’s Rendezvous on the Seine river cruise tour. After six days of eating great cheeses and downing fine wines and calvados (a regional apple brandy local to this area), there is much to like about both the Seine and Tauck’s spectacularly-refitted ms Sapphire. 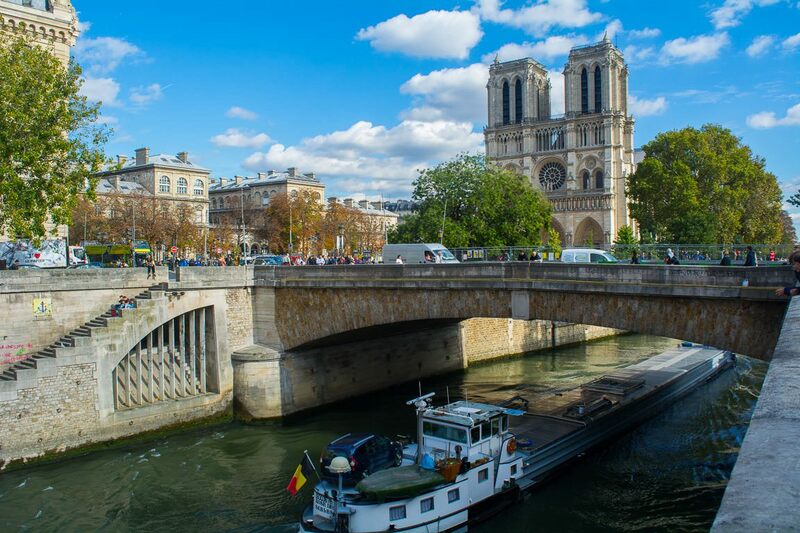 Beginning with a two-night stay in Paris at the hotel Pullman Paris Tour Eiffel, Tauck’s nine-day itinerary provides a fantastic overview of the splendors of the Seine, including visits to Rouen, Caudebec-en-Caux, Honfleur, Les Andelys, Vernon, and a full-day excursion to the D-Day Beaches and the Normandy American Cemetery and Memorial and Pointe Du Hoc sites near the town of Colleville-sur-Mer. While Paris has immediate appeal thanks to its prominence in popular culture, don’t be surprised if you fall in love with rural France too. 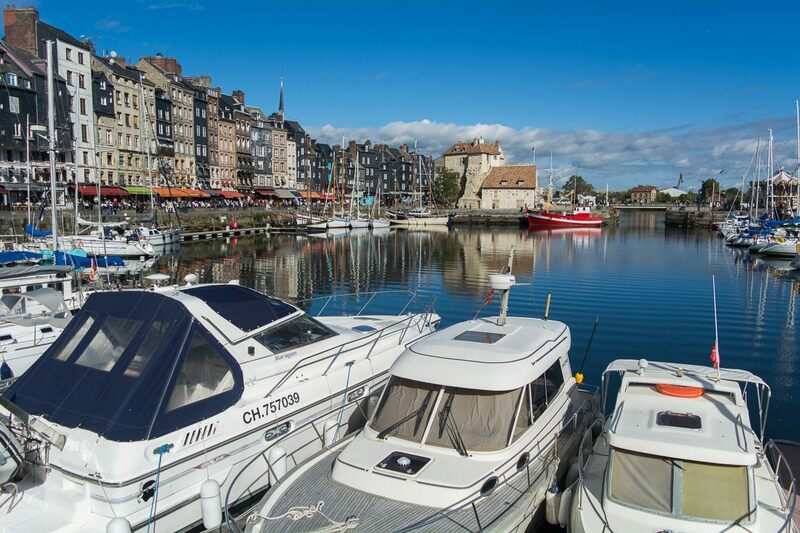 Though many guests have doubtlessly come here to see the D-Day Landing Sites at Normandy, I’ve found myself charmed by the small seaside towns of Honfleur and Étretat, where brasseries line the streets with their outdoor seating, inviting you to sit down to enjoy a glass of wine and some of the freshest mussels, now in season. Tauck prides itself on its all-inclusive river cruises that promise “uncommon access” ashore. This is my third Tauck voyage, and the company has done an excellent job of living up to my already-high expectations. 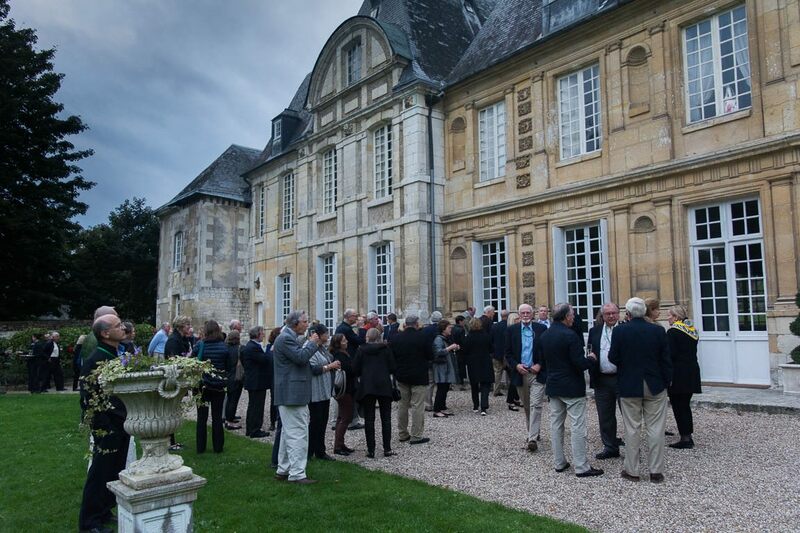 A few evenings ago, we were treated to a private dinner at the 16th-century Chateau du Taillis near Duclair, France. At dusk, Tauck put on a sunset cocktail reception on the front lawn of the Chateau, which has been lovingly preserved by its owners. Guests were then invited to come inside the Chateau for a five-course gourmet meal of regional specialties, lit entirely by candlelight. Dinner at the Chateau du Taillis is exclusive to Tauck; one of many special events the line prides itself on offering. Next year, Tauck is ramping up its offerings on this itinerary with a private after-hours visit to The Louvre in Paris, and lunch at the prestigious Ore restaurant located within the Chateau de Versailles. Other little touches help make the Tauck experience a special one. On full-day excursions that don’t include lunch, Tauck passed out €20 to each guest to buy meals on their own. With €40 per couple to spend, you can get a decent lunch here in Normandy – including wine – and still have some change left over. It’s part of Tauck’s all-inclusive commitment: No extras are sold onboard, outside of the ship’s small gift shop, and all beverages, meals and gratuities – for onboard staff, as well as drivers, guides, and porters – are included as part of the price. Tauck’s cruises aren’t inexpensive, but they do provide great value and the peace-of-mind that the company’s loyal guests are drawn to again and again. When Tauck put the ms Sapphire into drydock last winter, it decreased the number of guests onboard to just 98. 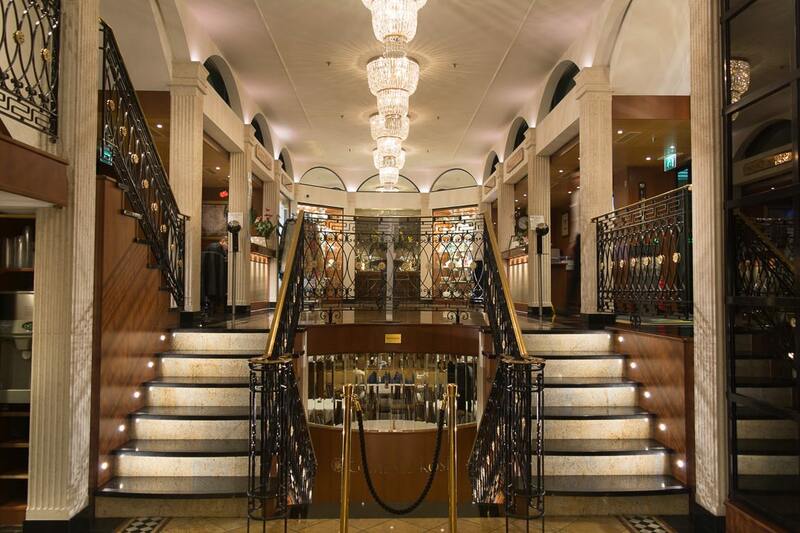 For a 361-foot long ship, that means that Tauck’s ms Sapphire offers up an uncommon amount of passenger space. During my week onboard, I haven’t seen a single instance of crowding. During lectures and cocktail hours, when most guests retreat to the embrace of the ship’s cozy wood-panelled lounge, there are plenty of tables for everyone, and a quiet space can always be found for bookworms looking to catch up on their reading. The ship’s main restaurant is never crowded, and all tables are rarely full. That gives guests the flexibility to dine as a couple (even at a table built for four), or to join in with their fellow guests. Well-travelled and well-educated, Tauck’s guests are a convivial bunch; don’t be surprised if you find yourself conversing with the table next to you, even if you’re dining solo or as a couple. Having just 98 guests onboard has also allowed Tauck to keep almost-unheard-of hours at Arthur’s, the ship’s casual dining venue all the way aft on Deck 3. Taking the guest capacity down to just 98 allowed Tauck to expand its accommodations offerings aboard ms Sapphire. 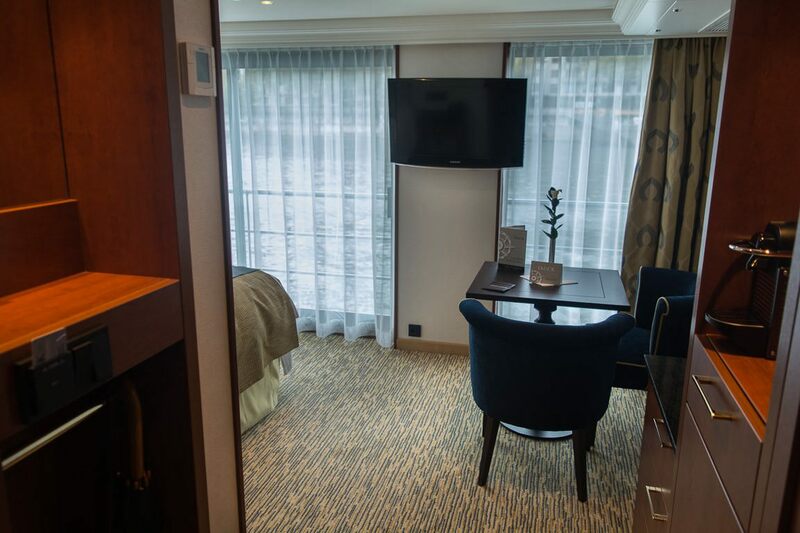 Last winter, Tauck – together with its river cruise operations partner Scylla AG – stripped the ship down, carving out twenty new Category 6 cabins on Deck 2, and 14 refitted Category 7 suites on Deck 3. 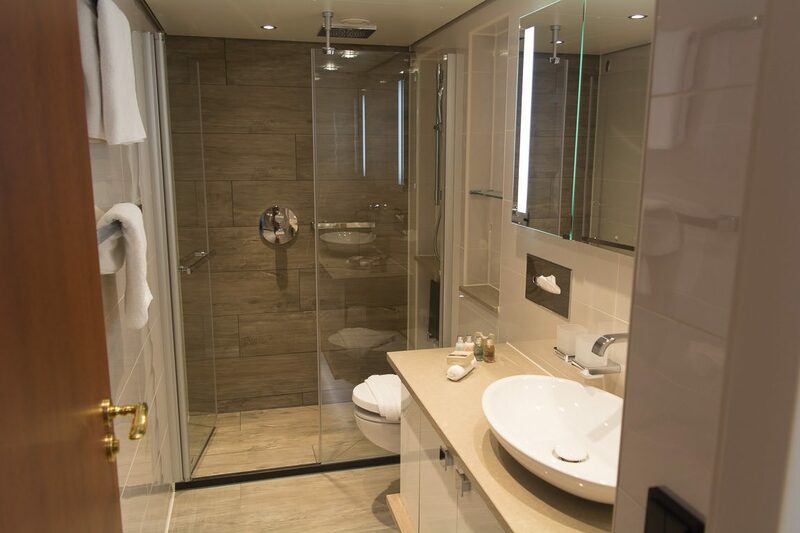 Both categories were given brand-new marble baths with rainforest showerheads, and are some of the most spacious bathrooms in the river cruise industry. I’ve been occupying a Category 6 Stateroom on Deck 2, and can attest that this newly-enlarged accommodation category is well worth it. Basically one-and-a-half standard staterooms, these rooms feature a French Balcony along with a half-width fixed window. Beds are situated to face the French Balcony, and there are half-a-dozen lighting options, from overhead lights to accent lights under (and inside) closets, along with well-positioned reading lights. These new rooms are large enough that there is space for a small sitting area with a proper table and two chairs, plus a bank of closets and a chest of drawers. An in-room Nespresso machine allows for coffee at any time, and mini-bars are complimentary and restocked daily. 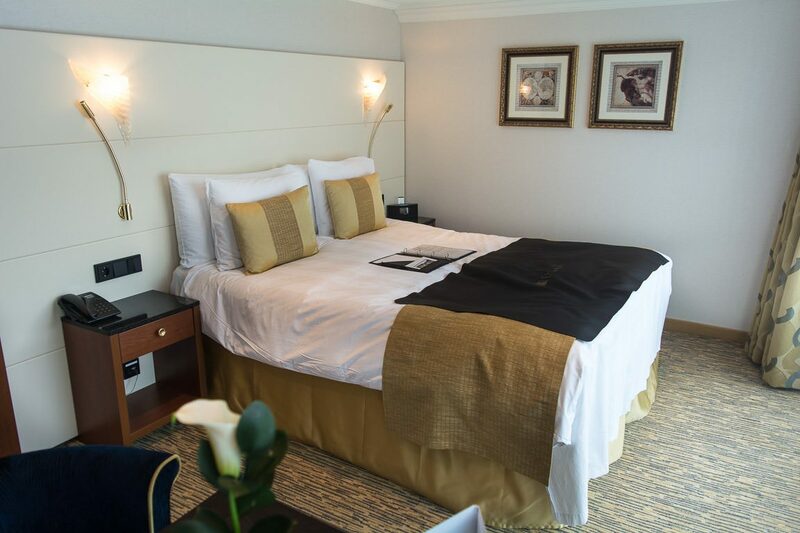 Across the ship, guests will find Molton Brown toiletries, plush beds, and an interactive video-on-demand system. Stem-to-stern WiFi is included, and access has been decent for much of the cruise. The WiFi system is a little complicated, however, requiring guests to bring their devices to Reception to scan a QR access code in order to create a password and user ID. It works great on my laptop, but I’ve been unable to make it work on my new iPhone. One piece of technology that works really well, though, is the new guest management system. 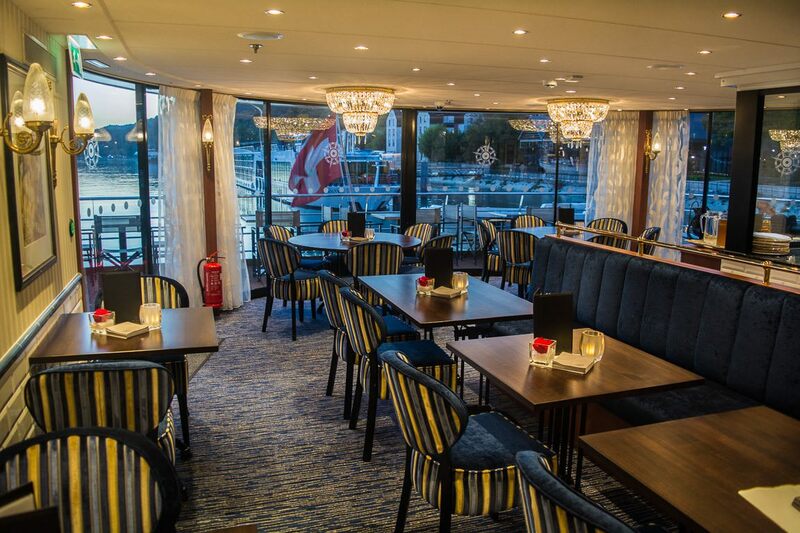 Say goodbye to queuing at reception for chips, cards, or shore passes: As a few other river cruise companies have done, Tauck has installed a new iPad-like system that guests tap their room keycards in and out on in order to embark or disembark the ship. Much like the process when you step ashore on an ocean cruise, this new system immediately tells Tauck which guests are onboard, and which are on-shore. It’s a huge improvement over the old system. 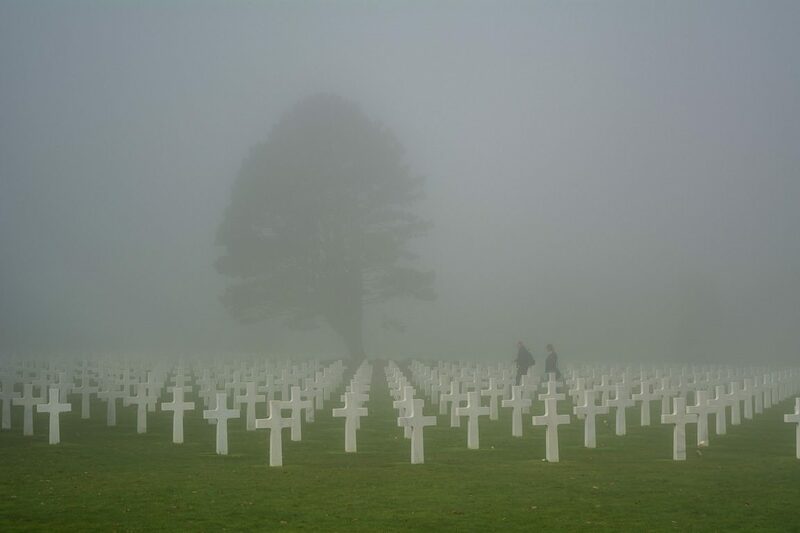 With three days still left on my journey, there is more to discover – including why you should take a river cruise on the Seine even if you have no interest on D-Day whatsoever. I’ll have more on that in a future article. For now, though, I should mention that one of Tauck’s greatest strengths – aside from the ship, which sparkles like new – is its crew. Three Tauck Directors guide each river cruise journey throughout its land portion, while another dedicated Tauck Director sails with the ship. That’s four dedicated “go-to” people on a single voyage. 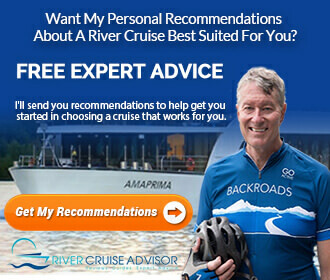 Most river cruise ships only have one such person for up to 190 guests. The same can be said for the crew aboard the ms Sapphire, who are friendly, personable, and go out of their way to make each guest feel valued. Don’t be surprised if your favorite drink arrives at your table before you’ve even thought to order it. While this is the second-last Rendezvous on the Seine river cruise of the season for Tauck, the 2018 season begins on April 3, 2018 and continues until the final departure on October 27, 2018. 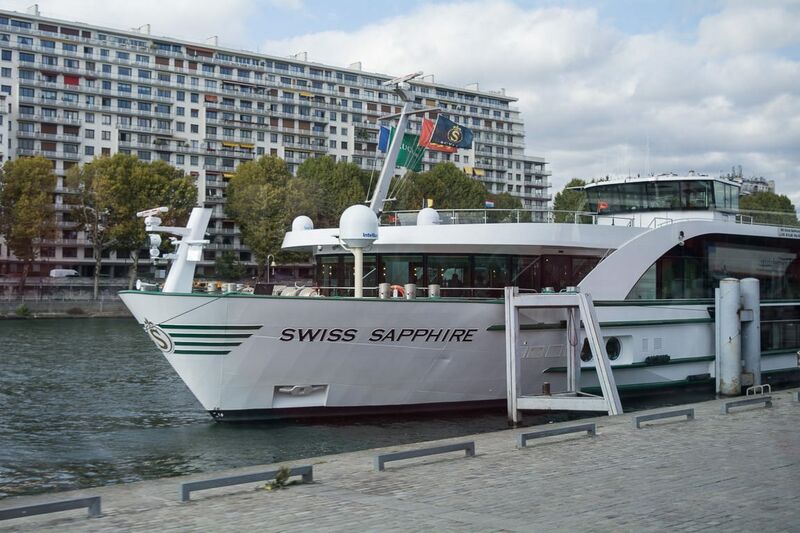 Like any river cruise, booking early is always a good idea, but even moreso now that the ms Sapphire only holds 98 guests. Tauck’s river cruises have always been extremely popular (the company has a tremendously-loyal following of past guests), so expect next year’s sailings to fill up quickly. My husband and I, along with friends, took this wonderful river cruise in late August. I blogged every day, describing the sites we visited and life aboard ship, plus lots of photos. My site is “musinwithsusan.com” Here you can also read about my adventures on previous Tauck tours, Cruising the Rhine and South Africa. Click on the “Travel” tab to navigate to the trips. Great review, Aaron. 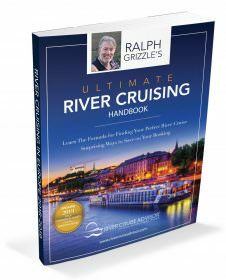 I’m doing my first Tauck river cruise next spring, and this has certainly whtted my appetite.